Ian Hodder was born in Bristol, England. He attended the University of London (B.A., 1971) and Cambridge University (Ph.D., 1975). Following a period of being a Professor at Leeds University, he became a Professor of Archaeology at Cambridge in 1977. He has also been a Visiting Professor at the Van Giffen Institute of Amsterdam, the Sorbonne in Paris, the State University of New York at Binghamton, and the University of California at Berkeley. Dr. Hodder began his current position as Professor of Anthropology and Co-Director of the Archaeology Center at Stanford University in 1999. Dr. Hodder is the author of numerous books on archaeology, including Symbols in Action (1982), The Present Past (1982), Reading the Past (1986), The Domestication of Europe (1990), Theory and Practice in Archaeology (1992), and The Archaeological Process (1999). He is a Fellow of the British Academy. He is well known for his work in archaeological theory, especially concerning Post-Processual Archaeology. He has also been greatly involved in the research of Neolithic Europe, ethnoarchaeology, and symbolic and structural archaeology. 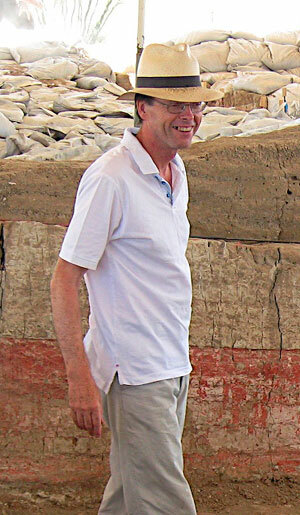 Dr. Hodder is the Director of the Çatalhöyük Archaeological Project. Çatalhöyük is a 9000-year-old Neolithic site in central Turkey, and one of the best-known archaeological sites in the world today. Dr. Hodder was the Awards Banquet Keynote Speaker at the 1999 SCA Annual Meeting in Sacramento. This interview was made possible through the efforts of SCA members Breck Parkman and C. Kristina Roper. IH: I was born in Bristol in England in 1948 but I traveled a lot as a child, spending time in Singapore and in Nigeria. During high school I lived in Oxford in England. Most of my school friends there were children of academic parents, and my father was an academic too. So I think that the two most important early experiences were travel and academia. IH: Apart from my father, I think the person who most influenced me I never met. When I went to study archaeology as an undergraduate in London, I was surrounded by the aura of Gordon Childe. The teaching at the Institute of Archaeology in London was still very Childean in the late 60s and early 70s, and I absorbed his approach and ideas. When I went to Cambridge to do my Ph.D. I owed the greatest of debts to David Clarke. He gave me little specific advice, but the space he opened up in archaeology had a lasting effect. He allowed us to think in new ways and with more freedom. He was also a wonderful person, articulate, sensitive, lively and without airs. He would not have agreed with the direction I went in after his early and tragic death, but I believe that he would have at least recognised the excitement I felt. SCA: Do you have any hobbies or special interests that you’d like to tell us about? What do you like to do when you want to get away from archaeology? IH: I have a number of ways of winding down. I play the piano quite a lot – as a way of letting off steam. I play anything really, by ear mainly, but I have also taught myself to play jazz and classical music. My main instrument was the violin but I rarely play it now. I used to play in quartets but the traveling made that difficult – so solitary on the piano works best for me, and sometimes on the guitar also. So music is the most important thing. I listen to music a lot and love opera and orchestral music. I try and do as much sporty things as I can also. I jog, but have recently bought a 27-foot sailing boat, which I keep in a bay north of San Francisco. Every weekend I can, which is not as many as I would like, I take the boat out sailing. I enjoy this enormously and wish I could persuade my family to be taken out more than I can! On vacation we walk a lot, and travel, and explore. SCA: Have you read a book or seen a movie recently that you really enjoyed, and what was it? IH: For books, I have recently been reading the work of Michael Ondaatje – The English Patient and Anil’s Ghost. I think he is a most remarkable writer and I love losing myself in his rich poetic prose. For films, I have just taken my kids to see the first of the Tolkein trilogy. It is impressive that technology now makes it possible to tackle such a text adequately for the first time. I thought the film was wonderful. SCA: If you hadn’t become an archaeologist, what might you have done? IH: At high school and at university I felt very drawn by development issues in less developed countries, and part of me still thinks I will return to that world at some point and get involved in international aid work. I guess this comes from that early traveling, but it was reinforced by the work I did in Africa in the 1970s and early 1980s published in ‘Symbols in action’. So if I had not got the digging bug I might have ended up in development and international relations. SCA: When did you first know that you wanted to become an archaeologist? IH: Probably when I was about 15 years old. I loved the traveling, and the way of traveling – archaeology allowed me to spend months in one place abroad, getting to know a place in a way that is so difficult as a tourist. And I liked the idea of a job away from a desk (little did I know how much archaeological deskwork I would have to do! ), outdoors, and sociable. And I found the digging process itself both satisfying physically and stimulating intellectually. SCA: What are some of your most memorable projects or experiences as an archaeologist? IH: I always get excited finding new things, however mundane they might be. On one of the first digs I went on, when I was still at high school, I found a tower on the Roman wall around Cambridge. I remember being very proud of that – even though I had just been lucky! Later I dug in beautiful and exotic places from Kenya to Knossos and from the high Andes to the Mount Carmel caves in Israel. But one of the most exciting moments was in the mid 1980s when I was directing an excavation of a Neolithic long burial mound in the Fens (a low-lying waterlogged area) in eastern England. I can still remember the thrill as I scraped over a flat area of wood that just got bigger and bigger as I cleared through the covering layers. In the end the wood turned out to be the roof of a burial chamber – remarkably preserved. More recently, the greatest experience was standing for the first time on Çatalhöyük. The archaeology there is so rich and detailed – I couldn’t believe how dense and how clear the layers were. I felt terribly excited about all the fantastic stuff that must lie beneath my feet, waiting to be discovered after 9000 years. SCA: What is the most important contribution that the study of Çatalhöyük has made to our understanding of the past? IH: The work of James Mellaart at Çatalhöyük in the 1960s made a great impact for a number of reasons. Perhaps most important, it showed that early complex settled villages developed outside as well as within the ‘Fertile Crescent’. But the art of the site was also astonishing – and the sheer size of the site at this early date. In the work that we have done at the site in the new phase of excavation since 1993, I think the most important points are that we have begun to understand the environment of Çatalhöyük, as well as its economy and social organisation. The new results from this work cover issues such as the role of women, the domestication of cattle, the invention of pottery, and site location at this time. For me, one of the most interesting contributions is that Çatalhöyük shows that very large social communities could be created within a ‘village –type’ organisation. It shows that large communities can be held together through the absorption of beliefs and daily practices rather than through the wielding of centralised power. SCA: If you could conduct your dream project, what would it be? IH: Çatalhöyük is very close to my dream project – and if it falls short that is entirely my fault, rather than lack of opportunity. I decided to work at the site for a 25 year period (if I can keep going that long!) because it offered the perfect opportunity to try out my ideas about how a project could be run. It is a fantastic site that attracts first-rate people to work on the project, and it attracts sufficient funding to make a good stab at doing some high quality archaeology. I have been able to introduce some of the reflexive methods that I had been talking about theoretically. Of course, one always wants to do more, and I wish I had still better funding to achieve some of my more ambitious goals. But I hope that will come and I look forward to the future at the site. SCA: If you could start over again, would you do anything differently? IH: Not really. My archaeology has been a learning experience. All the different steps I took, from the early spatial analysis, to the ethnoarchaeology, to defining postprocessual archaeology, to Çatalhöyük were all part of a learning process. I am glad that I took the line of discovery I did and would still ask the same questions and worry about the same problems if I could start over again. I was over-confrontational at times, but I felt bly – and maybe passion is important sometimes! IH: Well of course there are the accepted landmarks in the history of archaeology – the demonstration of the antiquity of humans and human culture, the writing of the main outlines of human cultural development, the demonstration of the diverse paths towards agricultural and urban societies. Today I think that archaeology is of importance in demonstrating diversity in an increasingly globalised world. But of course, the other, dangerous side of archaeology is the way it has been used to prop up nationalism and genocide. Today it is part of global, national and ethnic conflict wherever one looks. For me the great failure is still that archaeologists, however unwittingly, often collude in such processes of identity formation. The underlying difficulty is that we have not sufficiently argued against the idea that the past is something that can be owned. And we have not sufficiently shown to disadvantaged groups across the world how archaeology can play a beneficial role – although great strides have been made in this area in recent decades. SCA: Is it possible to democratize archaeology by more greatly involving the public? IH: I think one has to be careful in talking about ‘the public’ in relation to archaeology. I think it is wrong to conceive of ‘the public’ as unified or generic in some sense. And it is unhelpful too to confront ‘the public’ with ‘the archaeologist’. Rather, I would see a diversity of stakeholders. Any archaeological site will provide a focus for interactions between many groups, from developers and contractors to local government agencies, local residents, descendents, tourists, and archaeologists. The role of the archaeologist is to attempt to work between and in relation to all the stakeholder groups. I would define archaeology not as the excavation of traces of the past, but as the insertion of a particular methodology and perspective into people’s relations with their pasts. From such a point of view, it is clear that the archaeologist has to play a role as a member of society. The archaeologist has to engage in dialogue and communication, and to accept that there are different ways of pursuing the past. There are today many wonderful examples of collaborative and integrated archaeology. If I may be allowed to go off slightly at a tangent, the idea of public archaeology could be extended to a consideration of the role of the state in contract archaeology. I have just returned from a visit to Europe in which there was much discussion about the form that rescue archaeology should take in the different countries within the European Union. It was very striking that, despite knowledge of the deployment of private contracting firms in England and the United States, many countries are rejecting that model and are seeing the collapse of contracting firms. Instead, rescue archaeology remains the responsibility of the state, even if the funding is from the developer. Having seen something of the world of contract archaeology in the United States and England, I cannot help but feel the Europeans are right. If financial concerns predominate, archaeology, and being an archaeologist suffer. If contracts are offered to the lowest bidder, wider concerns, whether social, academic or professional in nature, cannot be adequately met. Pie in the sky as it may seem in the United States, it seems that a properly ‘public archaeology’ – that is one responsive to its various publics – needs to be de-privatised, or at least to be more carefully monitored by the state. The state should ideally play a greater role in funneling or regulating the relationship between developers and archaeologists. SCA: What can archaeology offer Native Americans and other native peoples? IH: Many of the collaborative schemes that I referred to above have involved Native Americans. I think a lot of very exciting work is being done in this area and I am extremely impressed by the innovative work of groups such as Kathy Dowdall and Otis Parrish in California. Archaeology has been a focus of identity formation and social tension for many Native American groups. It has helped form new identities, and raise income in some instances. Archaeology can provide opportunity to enter into or reject claims of indigenous rights. It provides a route of entry into different worlds. But it is always a struggle, as opposing forces claim ownership. It worries me that so often, Native American archaeology is conceived as just archaeology as usual – but in the context of Native American identities. It seems we are missing the opportunity to redefine what archaeology is, what the past is, whether it can be owned, whether it can be objectively studied and classified, and so on. It seems we should take the opportunity to construct an ‘unusual’ archaeology – one that involves hybrid methods and that involves ‘pushing the envelope’ of archaeology as we have come to know it. SCA: Is there a continued anthropological relevancy to archaeology? IH: I know that many archaeologists in the United States would say that they are first anthropologists and second archaeologists. I don’t feel that at all. I feel that archaeology is a mature and independent discipline that can contribute to other disciplines and is not contained by any of those other disciplines. I feel just as close to history and the natural sciences as I do to anthropology. I believe bly that anthropology can be a straightjacket for archaeology in the United States. But I do feel that archaeology can contribute to anthropology. I enjoy working with anthropologists and am glad that I have moved to work in an anthropological department at Stanford. But I like to think that, whatever labels we work under, we contribute to similar issues from separate and independent perspectives. It seems to me that there is much movement and realignment in the sciences and humanities at the moment, across the board. People are continually making new alliances across old disciplinary boundaries. Some archaeologists may wish to make allies in the natural sciences; others in the social sciences; others in the humanities. Archaeology can contribute to debates with anthropology – but this should not hinder its pursuit of alliances with history, cultural studies, biology, evolutionary ecology, geophysics and so on. SCA: In your opinion, what might the future hold for archaeology? IH: If anything, I believe that archaeology will increase its roles in the future. This is partly for academic reasons – the retreat from the linguistic metaphor and the embrace of the ‘real’ and the material in the social sciences and humanities. And it is partly because of the continued importance of CRM. But I also think the role of archaeology will increase socially. All societies need ‘others’ which fascinate, repel, and contrast with their own ways of doing things. As the ethnographic ‘other’ becomes rare and problematic, so archaeology offers the most significant source of cultural diversity. By turning over the soil new things are discovered which have to be confronted and made sense of. This will continue to be a social process in which archaeologists play a role. IH: I do not believe in the ‘end of history’ hypothesis. I have already referred to the search for cultural diversity which seems so much at the heart of contemporary life. The past is increasingly, not decreasingly, being used to help form new and diverse identities – not only for disadvantaged groups but also for those from high-income areas and classes. One important way in which this new search is expressed for the latter groups is through travel and tourism. Cultural tourism is of increasing importance, and it provides a new framework for much global archaeology. The past can in the process be further commodified and commercialised. However the tensions between the past as theme park, as focus of identity, and as science play out, the past is assured a key and central role. As writers such as Trigger have shown, the initial relevancy for archaeology was in the context of nationalism, colonialism and imperialism. Whatever one thinks of the idea that we are moving into a post-colonial era in which the nation state is being undermined by global processes, my own judgment is that archaeology is finding a new relevance within a globalized world. In particular it is becoming very closely tied to multi-culturalism and diaspora. Within this new context, the archaeological past has a quite different role linked to personal identity and even spirituality, tourism, the authentic, the nostalgic and so on. I am not sure where this will all lead, but I do think that the relevance of the archaeological past will increase in this new role.